While craigc and James my grandson were out somewhere else getting Jame's his first deer, Brian and I were off for a couple of nights getting our zillionth. We stayed in a hut on the back of a Station which we hunt on from time to time. 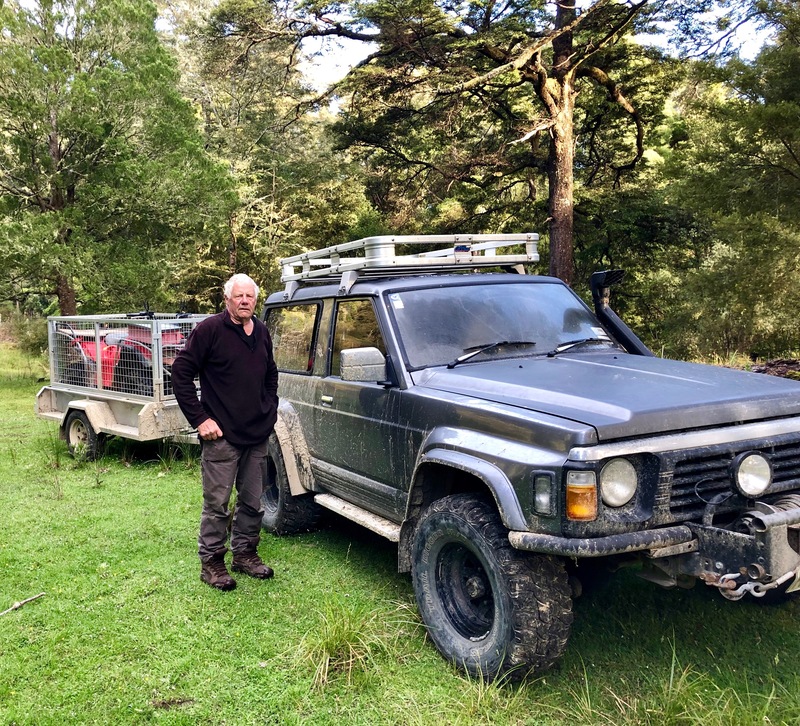 Yes its private but its big, rough and you still need to haul arse to get a deer. We make it hard for ourselves though because we avoid the tracks and always seem to be looking into the steepest and spookiest places. The first evening was cold and raining with clear patches and we spotted a group of 3 Fallow that we don't see many of. Brian went off to have a go for a spiker but it didn't turn out well for I'm and he came back empty handed. Meanwhile I set off and spotted a hind which I left (we had agreed between ourselves that we would only shoot small stags). 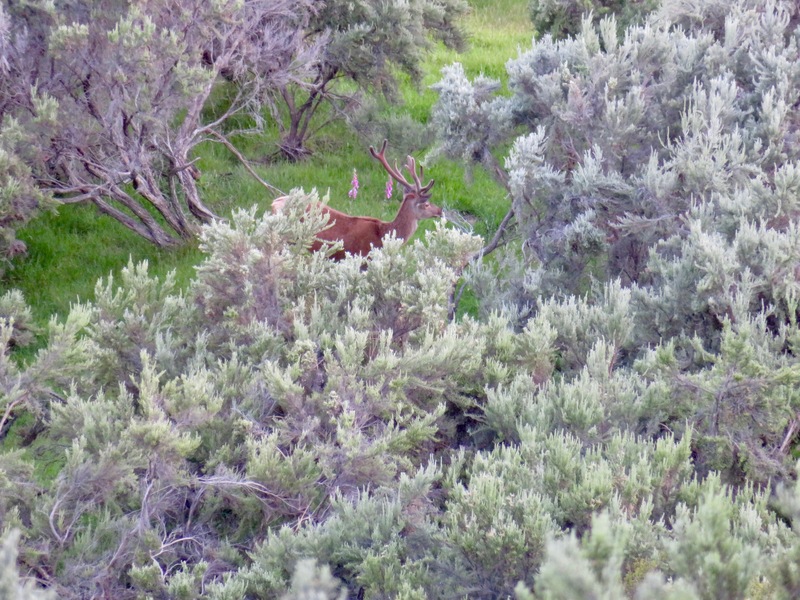 After about a couple hours of walking and hunting I spotted 3 deer and one looked like a stag so I set off after them. I got into the gully I thought they had disappeared into but Tilly was winding over the ridge, so I guessed I had dropped off the wrong side. 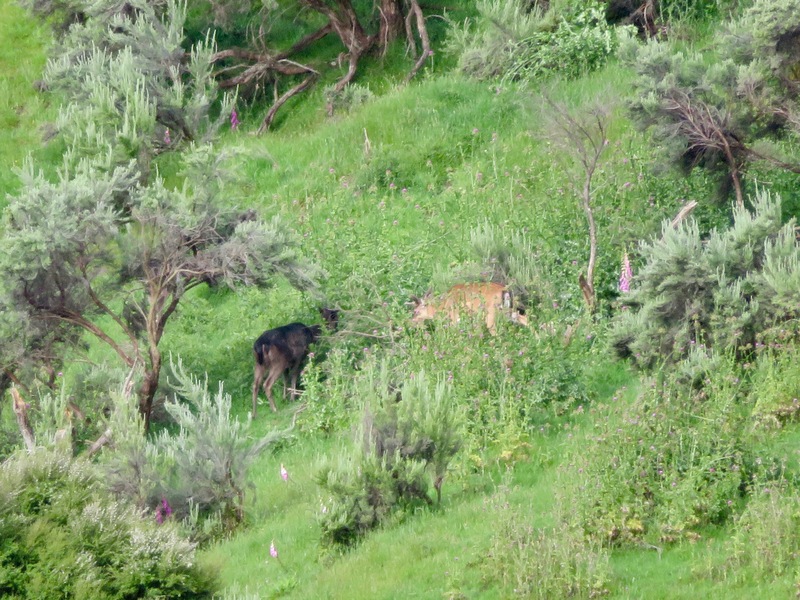 She winded me over into the next gully and sure enough I spied a hind trotting off at about 50 yards. I left her but couldn't find her mates. So I crossed a big gully and and headed for a last chance spot which was a clearing surrounded by nice cover. As I worked around a face I first spotted a hind moving through the beech, and then in the clearing a yearling and its mate laying down. 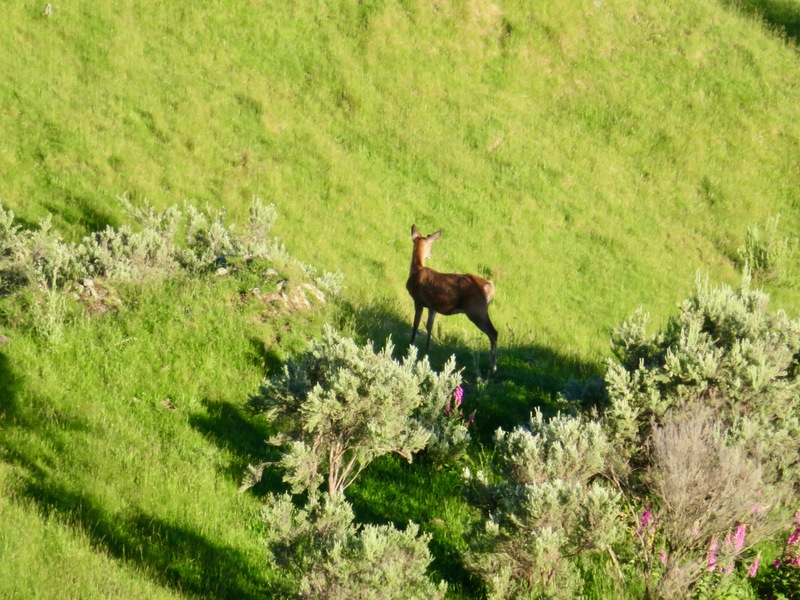 I took a pic of the yummiest one and zoomed it right up to check that it was a young stag - it was. 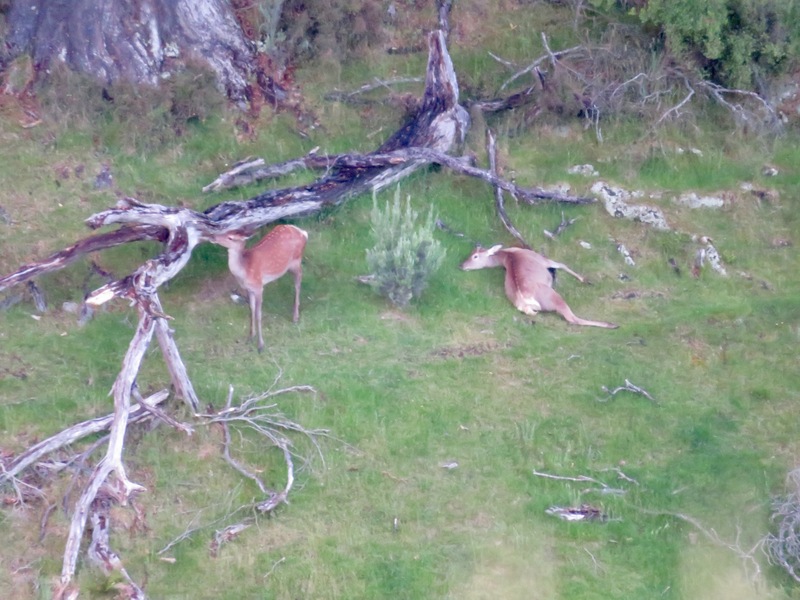 They were 230 yards across the gully and there was a strong wind. I estimated it at 15mph. While I was carefully getting ready it stood up and started to casually groom itself. I had plenty of time so I laid down and took a careful shot with the 300saum, giving about 6" lead for the wind. At the shot, it didn't move apart from its head dropping. Its mate stood up, stretched, and wandered over. 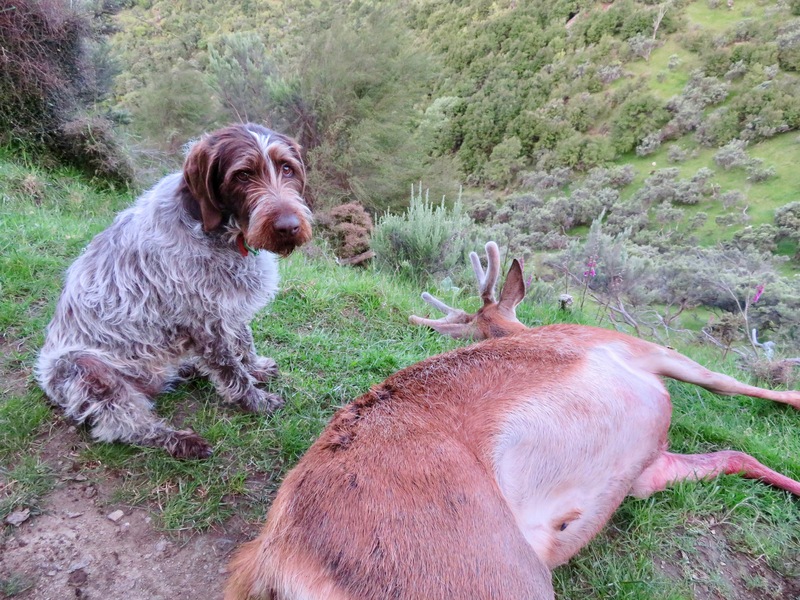 It sniffed and circled its dead mate for over 5 minutes. It was quite sad really. In the end it wandered off. I had to cross a steep gorge to get to it but by following game trails I found a way over, albeit with some detours. Even in the roughest places if you follow a game trail its almost always the easiest way around. I had hit the animal square in the shoulder and it was no big task to diss-assemble it into pack size pieces. The last task was to plodge up to a track for 40 minutes where I met Brian who had had no luck, but had seen a few. We were in the scratcher by 10.30 and up early for the next day's "Boys Own" adventure. We had decided to look at another area and on our way Brian's dog Tux showed some interest up a gully and sure enough I heard Brian say "there's a couple". 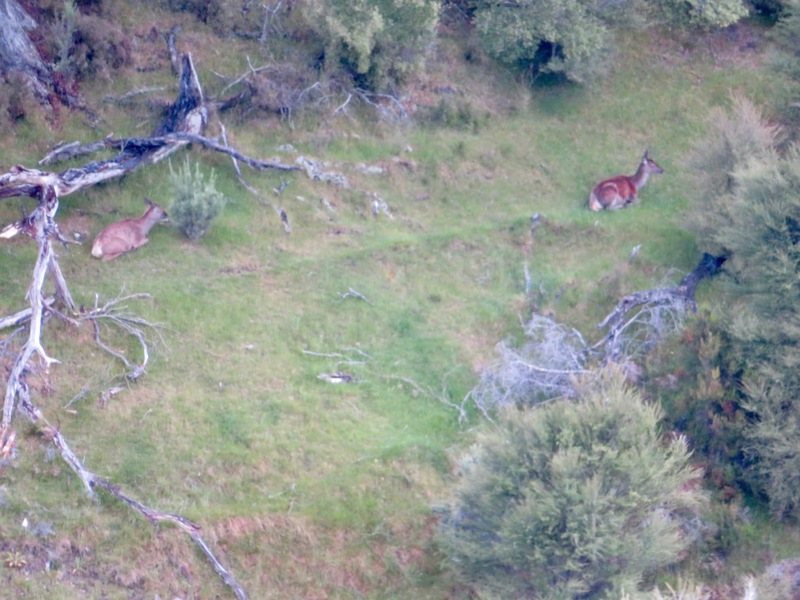 A stag and hind were running across a clearing 80 yards away. I gave the stag some lead and fired (I could see that he had a poor head) and he appeared un-hit but after a few yards he stopped and started to do a wobble. I gave him one in the neck to make sure but it wasn't really needed because the first shot had hit him square in the shoulders. It was still early so Brian carried on while I dealt to this big chap. It was very pleasant having plenty of time to butcher the stag and to muck around a bit. Almost all of our hunting is in the evening and we always seem to be floundering around in the dark. 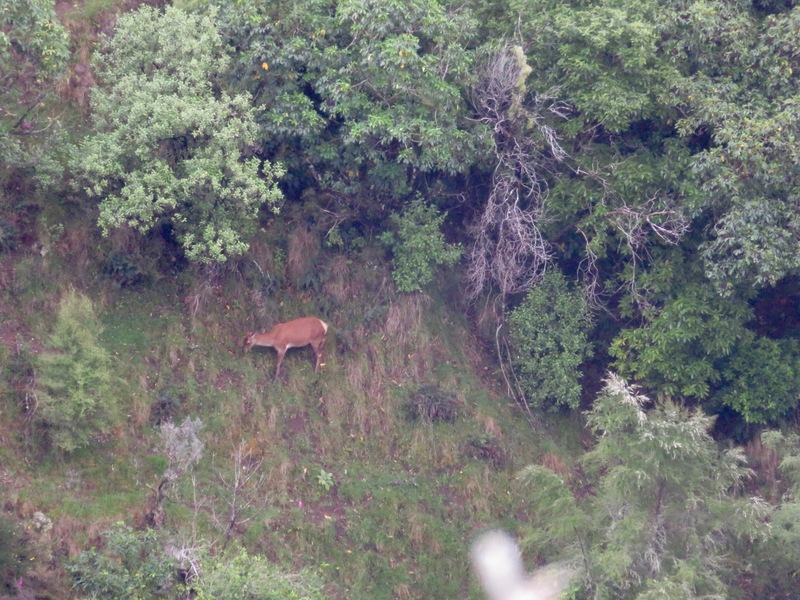 Instead of a rushed job I took an hour or so and then leisurely looked around a bit (spotted a hind) and headed back to the hut. I slept for 2 hours - and Brian got back about lunch time with a young stag he had shot. 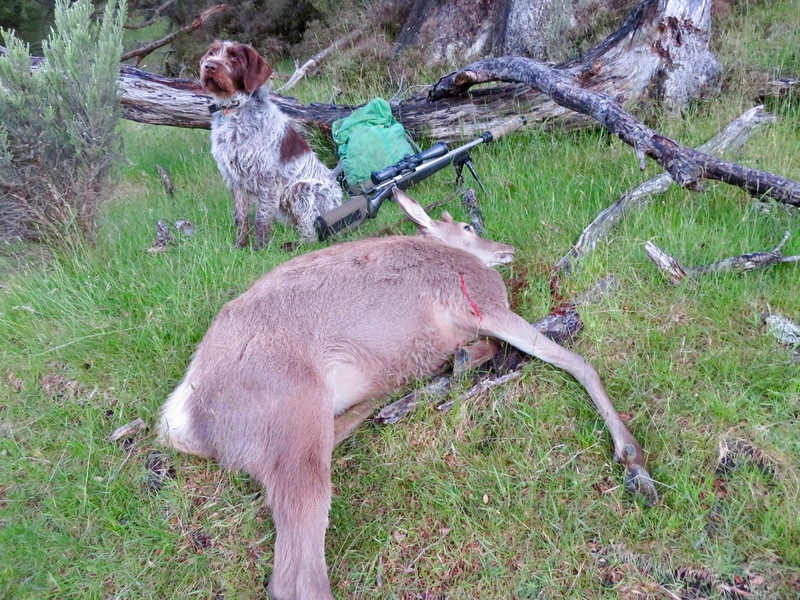 His young dog had done a great track of a hundred yards after the shot and had pointed some deer - great stuff. And 3 deer on the board. That evening (our last hunt-we were heading out early in the morning) we headed off in seperate directions. It was a perfect evening after a lot of rain and I had a great time. 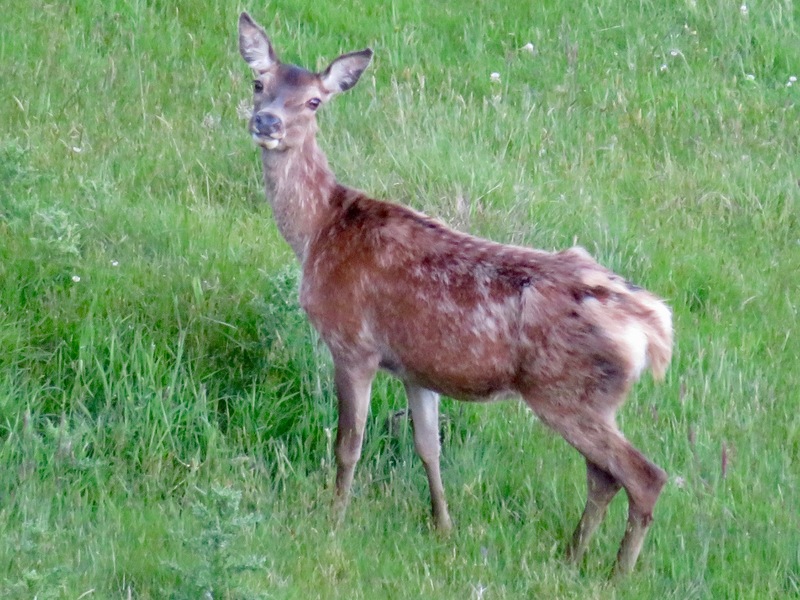 I saw several deer, and one nice velvet stag with a pheasant standing guard - very unusual. Tilly was besides herself with all of the winding and was a bit perplexed that there was no gun-fire. On my way back to meet Brian, Tilly was winding and I came around a corner and there were 3 deer that had spooked and were gapping it through the scrub. I got a bead on a small velvety and let rip into his shoulder. 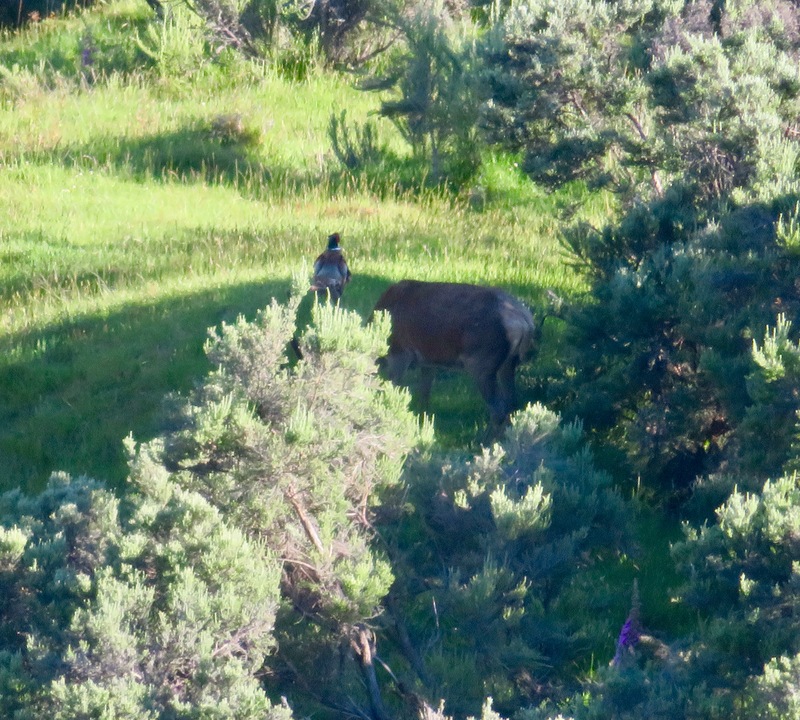 He was about 100 yards away. 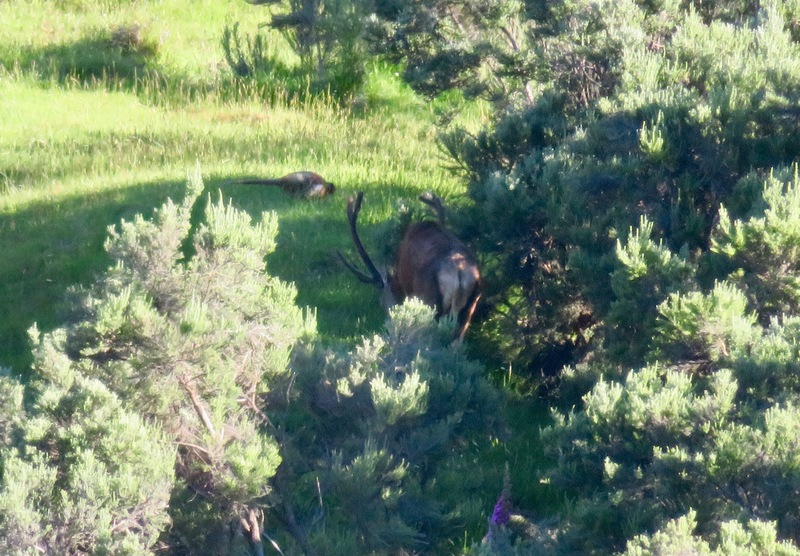 The shot tipped him over and he bowled off down through the scrub. 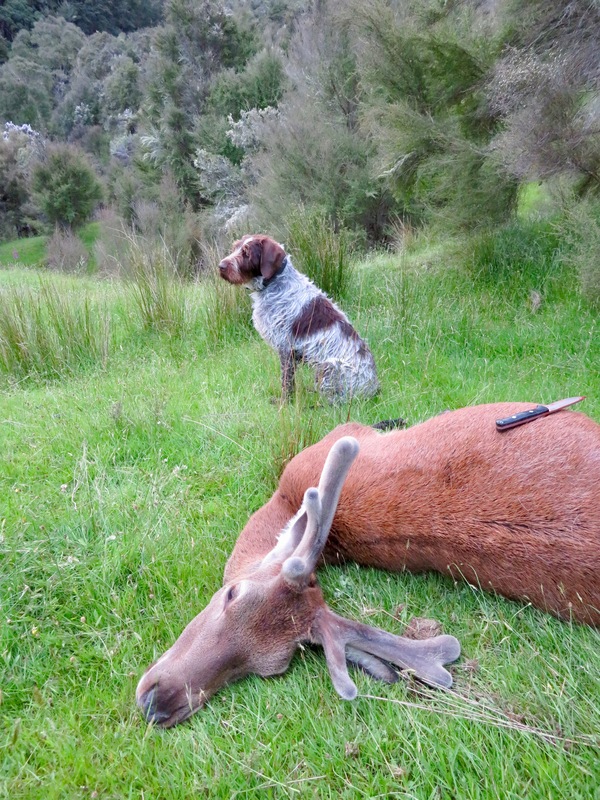 It didn't take Tilly much to find it and I was able to bowl it down hill to a handy spot to do the butchering. I was in no hurry because there was still some light left. I was contemplating the pleasures of life next to the deer when I heard a quad, and it was a chap doing 'possums, who I chatted to for a while. Eventually Brian turned up too so we all yarned while I did the butchering and we then went our seperate ways. Brian had seen a few but shot nothing. 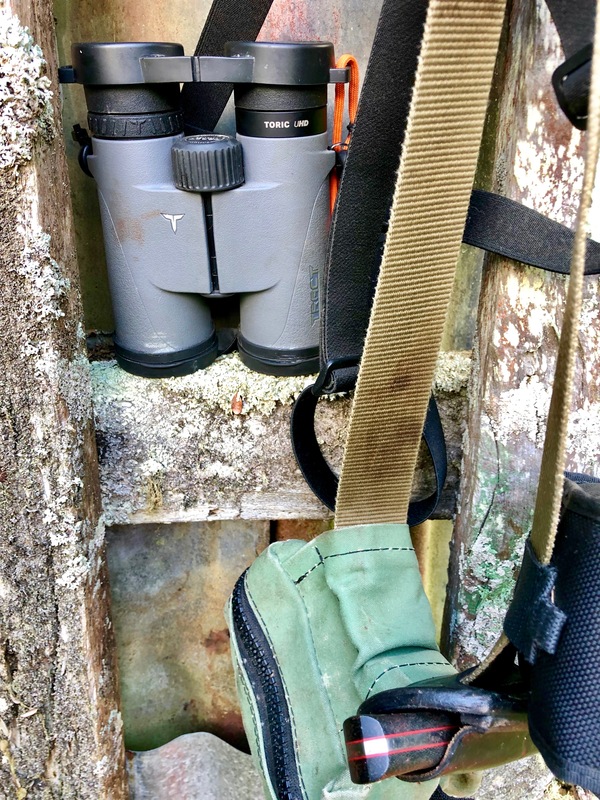 It was great trip and there were plenty of spring deer seen. Good company, good exercise and a good mate. Life is good. Brian and his trusty Nissan. Packed and ready to head out. Last edited by Tahr; 09-12-2018 at 10:16 AM. Wildman, Nathan F, sako75 and 36 others like this. some nice looking animals oh and some nice deer too. Imagine what would happen if our universes collided? Tahr and rewa like this. Cool read - you guys are living the dream . looks like to me, that you and Brian pretty much have life sorted, and are now living the dream!! well done gents, enjoyed the yarn and the photo's. Tahr, Brian and dannyb like this. You guys are having a blast, some very nice animals there and great pics. You guys are a bit like Beeman and myself hard at it whenever we can.